Simply put Invisalign is an orthodontic treatment used for straightening upper and lower teeth. It involves custom made ‘aligners’ that are worn by the patient and usually changed every 2 weeks for the next stage until the treatment is complete. ements of the teeth through the treatment process and what we can expect to achieve for the final result. The next step will be a second appointment where things really start moving. The patient will receive their first set of aligners and the dentist will check everything is fitting well. The patient will also be given the following stages that can simply be switched over when necessary. From here the patient will wear aligners as instructed, we recommend a 6 weekly review throughout treatment to check the teeths progress. 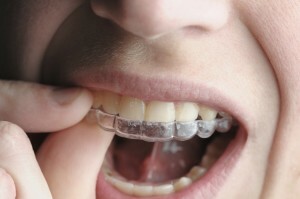 After each specialised set of aligners have been worn the treatment is complete. The specially made aligners are clear trays that are virtually invisible when being worn, they are very comfortable and become a normal part of the user’s everyday life. They are easily removed meaning the patient can brush and floss teeth just as they would normally do. All of these feature make them a much preferred option to conventional fixed braces. Invisalign can treat a wide range of positioning issues including overcrowding, gappy teeth, cross bites, over bites and under bites. As the trays are made for each individual it is suitable for straight forward cases involving few teeth or extremely complicated cases where much more of the jaw is concerened. The main difference between patients will be the length of the treatment typically ranging from as little as 6 months to 2 years.